Traditional yew wood bow - this one has large recurves, british tan stain, leather handle, bison horn tip overlays and arrow rest. Beautiful bow and great shooter! All our bows are made with one piece of yew wood - just as has been done for thousands of years. We use natural materials and can custom build anything you can dream. 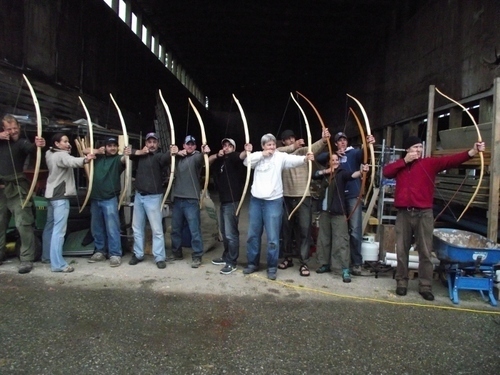 Our bows are used for hunting, target shooting, reinactment, and just for fun! Yew wood traditional bow: large recurves, silk and snakeskin backing, british tan stain, leather handle, cow horn tip overlays. Sharp looking and sharp shooting. 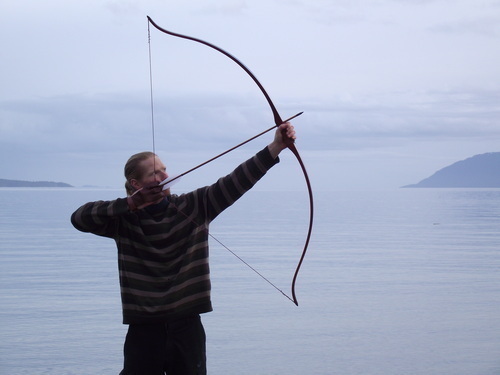 Build a bow from stave (raw log section) to beautiful and functional finished bow. All materials and tools provided, as well as a delicious lunch. Build a bow with all the extras! Tip overlays (horn, hardwood, etc. ), recurves, backings, stain and more.